You must keep these fish as a pair. They are peaceful to other fishes except in breeding time. You should set up the aquarium with some driftwood and some big plants that are well potted, because the fish burrow in the substrate. There should be a deep substrate of fine sand. You should feed them big live food like worms or fish. Breeding is easy. 1000-2000 eggs are laid on a previously cleaned stone. Both parents take care of the fry. When they are hatched the fry is moved to a pit. When they are swimming free you can feed the young fishes with baby brine shrimp and small cyclops. Possible tank mates are appropriately sized African knifefish, bala sharks, blue acara, clown loaches, firemouths, jack dempseys, pacus, pictus catfish, plecostomus, silver dollars, texas cichlids and tin foil barbs. 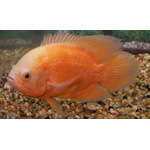 Heavy filtration and frequent partial water changes are a must, as these are messy eaters. Lax attention to water quality may lead to “Hole-in-the-Head” disease.